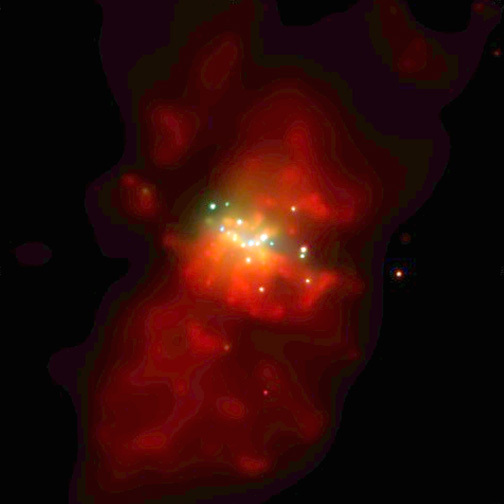 This Chandra image is colorized to highlight a population of point-like "ultraluminous" X-ray sources in M82, a starburst galaxy 11 million light years from Earth. In the image, red represents the low energy band, green intermediate, and blue the highest observed energies. The white and yellow sources are those that emit significant amounts of both low- and high-energy X-rays. The ultraluminous sources, which emit ten to several hundred times more X-ray power than similar sources in our Galaxy, are believed to be either massive black holes, or black holes that are beaming energy toward Earth. The brightest point-like source, located near the center of the image, is the most powerful ultraluminous source detected in any galaxy to date. Observations of M82 and other starburst galaxies suggest that the origin of ultraluminous sources is related to a burst of star formation triggered by a collision with another galaxy. Astronomers suspect that M82 had a close encounter with a large galaxy, M81 in the last 100 million years. The diffuse red cloud in the image is caused by multi-million degree gas flowing out of the central region of M82. Coordinates (J2000) RA 09h 55m 50.70s | Dec +69° 40´ 37"